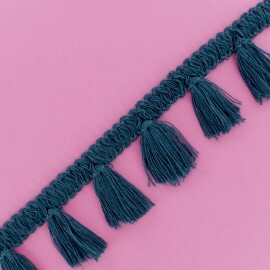 Add style to your interior with the peacock blue Antoinette tassel trim! This braid trimmings ribbon is ideal to customize truck curtains, furniture such as chairs, armchairs, sofas and even accessories. Chic or bohemian atmosphere, you choose! 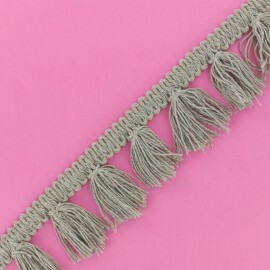 Add style to your interior with the stormy grey Antoinette tassel trim! 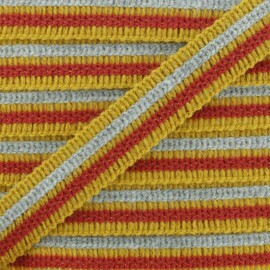 This braid trimmings ribbon is ideal to customize truck curtains, furniture such as chairs, armchairs, sofas and even accessories. Chic or bohemian atmosphere, you choose! 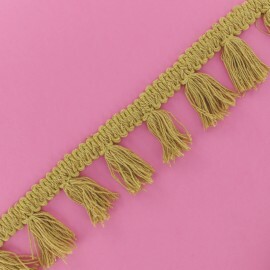 Add style to your interior with the honey Antoinette tassel trim! This braid trimmings ribbon is ideal to customize truck curtains, furniture such as chairs, armchairs, sofas and even accessories. Chic or bohemian atmosphere, you choose! 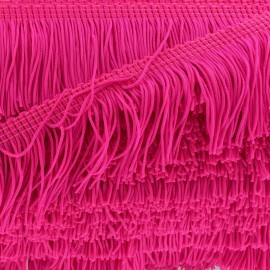 Add style to your interior with the Havana Antoinette tassel trim! This braid trimmings ribbon is ideal to customize your furniture such as chairs, armchairs, sofas and even accessories. Chic or bohemian atmosphere, you choose! 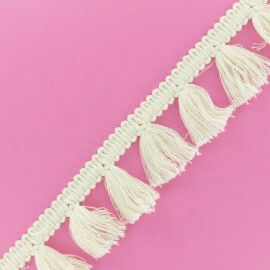 Add style to your interior with the vanilla Antoinette tassel trim! 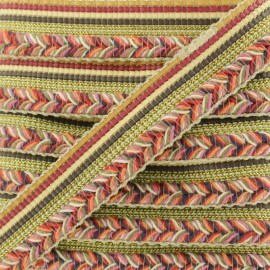 This braid trimmings ribbon is ideal to customize your furniture such as chairs, armchairs, sofas and even accessories. Chic or bohemian atmosphere, you choose! 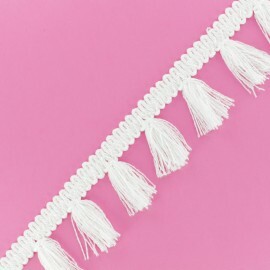 Add style to your interior with the off-white Antoinette tassel trim! 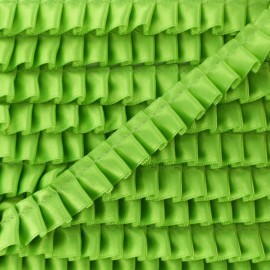 This braid trimmings ribbon is ideal to customize your furniture such as chairs, armchairs, sofas and even accessories. Chic or bohemian atmosphere, you choose! 20 mm mustard wool type braid. Make your basic pants an original piece with this striped trim or add some fanciness to your sleeve edges! 20 mm blue wool type braid. Make your basic pants an original piece with this striped trim or add some fanciness to your sleeve edges! 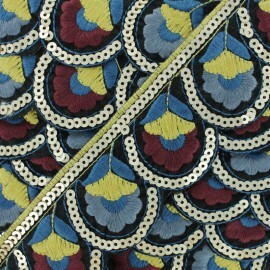 Enhance your cushions, curtains, lamps and other decorations with this beautiful multicolored pompon trim! You will love this braid trimming with long tassels, which will give a little bohemian aspect to your interior. Never go unnoticed : embellish also your clothes with it! 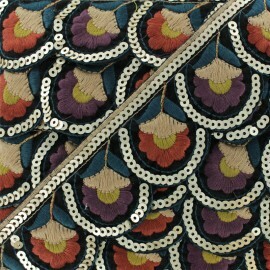 Get original creations with our bohemian chic trim! You'll love sewing this metallic sequined ribbon on a decorative pillow or even a pretty denim jacket! These floral embellishments in winter tones will be perfect for the coldest seasons! 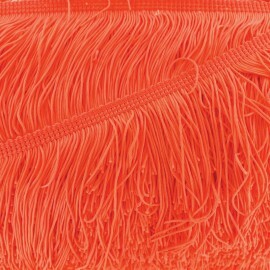 Add some fun to your creations with this beautiful neon coral fringe trimming ribbon. Find all our apparel and furnishing fabrics and realize your unique creation. 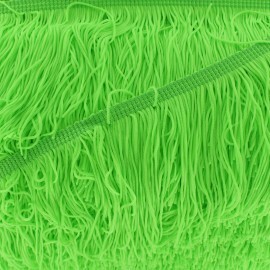 Add some fun to your creations with this beautiful neon green fringe trimming ribbon. Find all our apparel and furnishing fabrics and realize your unique creation. 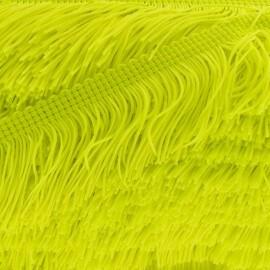 Add some fun to your creations with this beautiful neon yellow fringe trimming ribbon available in 50 and 100m. Find all our apparel and furnishing fabrics and realize your unique creation. 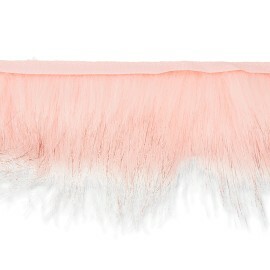 Add some fun to your creations with this beautiful 50 mm neon pink fringe trimming ribbon. Find all our apparel and furnishing fabrics and realize your unique creation. 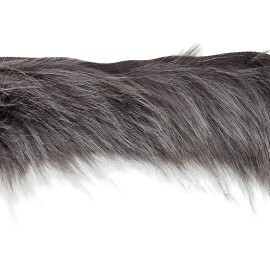 Make beautiful coats and jackets with this grey faux fur collar. Border your hoods and your jacket collar with this sew-on fur. You will not go unnoticed! Thanks to the little ribbons sewn along the fur, the seam of this ready-to-use fur collar will be very easy! Make beautiful coats and jackets with this dark blond faux fur collar. Border your hoods and your jacket collar with this sew-on fur. You will not go unnoticed! Thanks to the little ribbons sewn along the fur, the seam of this ready-to-use fur collar will be very easy! 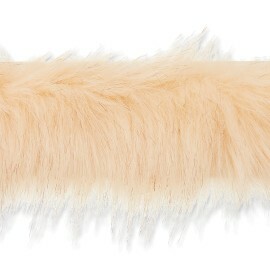 Make beautiful coats and jackets with this beige faux fur collar. Border your hoods and your jacket collar with this sew-on fur. You will not go unnoticed! Thanks to the little ribbons sewn along the fur, the seam of this ready-to-use fur collar will be very easy! 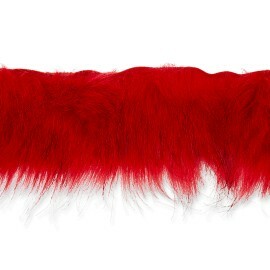 Make beautiful coats and jackets with this red faux fur collar. Border your hoods and your jacket collar with this sew-on fur. You will not go unnoticed! 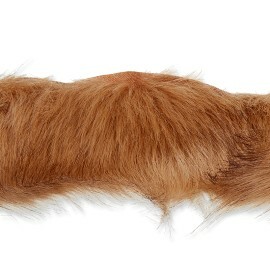 Thanks to the little ribbons sewn along the fur, the seam of this ready-to-use fur collar will be very easy! Make beautiful coats and jackets with this purple faux fur collar. Border your hoods and your jacket collar with this sew-on fur. You will not go unnoticed! Thanks to the little ribbons sewn along the fur, the seam of this ready-to-use fur collar will be very easy! 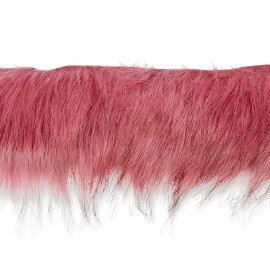 Make beautiful coats and jackets with this candy pink faux fur collar. Border your hoods and your jacket collar with this sew-on fur. You will not go unnoticed! Thanks to the little ribbons sewn along the fur, the seam of this ready-to-use fur collar will be very easy! 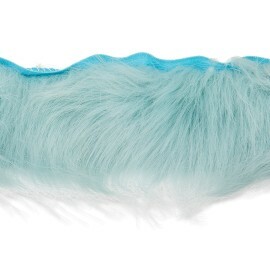 Make beautiful coats and jackets with this sky blue faux fur collar. Border your hoods and your jacket collar with this sew-on fur. You will not go unnoticed! Thanks to the little ribbons sewn along the fur, the seam of this ready-to-use fur collar will be very easy! Make beautiful coats and jackets with this peacock blue faux fur collar. Border your hoods and your jacket collar with this sew-on fur. You will not go unnoticed! Thanks to the little ribbons sewn along the fur, the seam of this ready-to-use fur collar will be very easy! 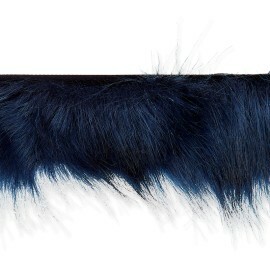 Make beautiful coats and jackets with this navy blue faux fur collar. Border your hoods and your jacket collar with this sew-on fur. You will not go unnoticed! Thanks to the little ribbons sewn along the fur, the seam of this ready-to-use fur collar will be very easy! 30 mm brown Soraya ribbon. Vibrant and colorful, you'll love the oriental spirit of this quality braid! With faux leather trim and glittery details, create bags, clothes and accessories with the Soraya braid. 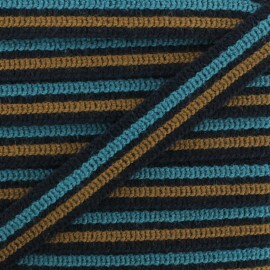 25 mm Eleonore Braided Trim. This high-quality, warm-toned trim is specially designed for upholstery work. 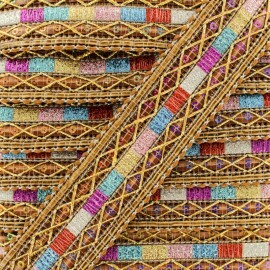 You will appreciate its braid with interlaced and colored threads and its royal aspect brought by the golden lurex thread. This braid will also be suitable for clothing. 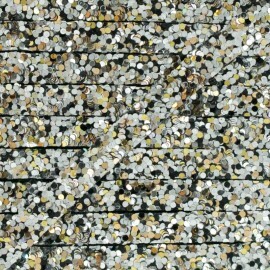 7 mm silver Glitter trim to iron-on. This quality glittery ribbon is unique and very easy to apply. It will allow you to customize a bag or a pouche in the blink of an eye by bringing shine and glamour to your creation ! Stay trendy and always at the top with the Ma petite mercerie selection ! 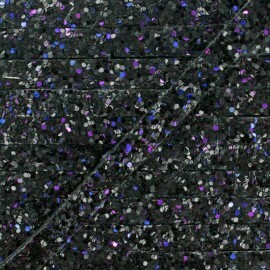 7 mm Shadow Glitter trim to iron-on. This quality glittery ribbon is unique and very easy to apply. It will allow you to customize a bag or a pouche in the blink of an eye by bringing shine and glamour to your creation ! Stay trendy and always at the top with the Ma petite mercerie selection ! 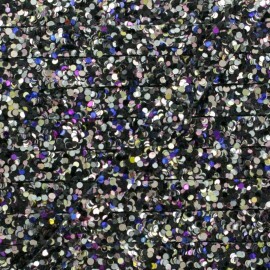 7 mm Glitter trim to iron-on. This quality glittery ribbon is unique and very easy to apply. It will allow you to customize a bag or a pouche in the blink of an eye by bringing shine and glamour to your creation ! Stay trendy and always at the top with the Ma petite mercerie selection ! 12 mm mosaic trim to iron-on. 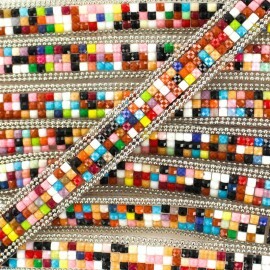 This trim with colorful polyester stones is perfect to customize bags and accessories. It is easy to place and it simply need to be ironed on textile to stick. 23 mm ecru braid trim. Fall for this pretty refined ribbon with beads and rhinestones for a sublime look ! Evening gown, wedding dress or simple jacket, this trim will definitely put you under the light ! 23 mm black braid trim. Fall for this pretty refined ribbon with beads and rhinestones for a sublime look ! Evening gown, wedding dress or simple jacket, this trim will definitely put you under the light ! 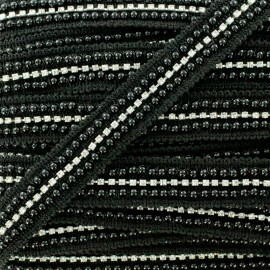 Black Bead and Lace braid trim available in 15 mm and 40 mm. 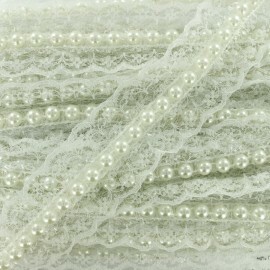 Create delicate clothes, lingerie or embellish a wedding dress with this superb ecru beaded lace braid trim. Beautiful accessories and jewels will make you look stunning ! 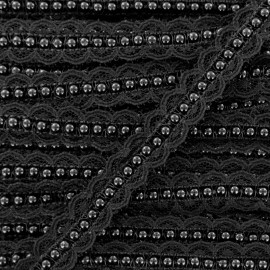 Black Bead and Lace braid trim available in 15 mm and 40 mm. 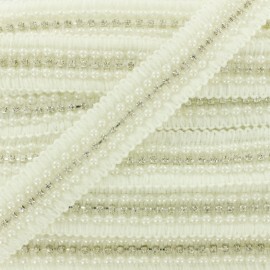 Create delicate clothes, lingerie or embellish a wedding dress with this superb beaded lace braid trim. Beautiful accessories and jewels will make you look stunning ! 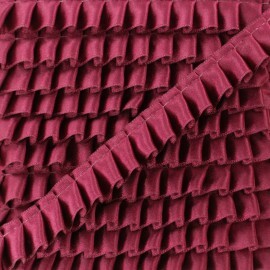 15 mm pleated ribbon in raspberry red satin. The pleated satin braid is a basic of sewing, choose the color that suits you and finish nicely your clothes (sleeves, neck, etc.) 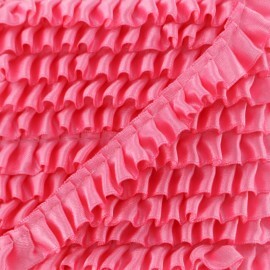 or add some frilly satin ribbon to your interior: on your lamps, curtains, chairs and a lot more ! 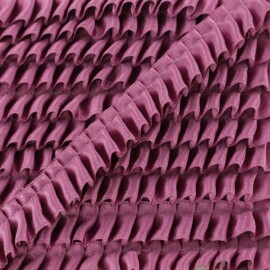 15 mm pleated ribbon in boysenberry satin. The pleated satin braid is a basic of sewing, choose the color that suits you and finish nicely your clothes (sleeves, neck, etc.) or add some frilly satin ribbon to your interior: on your lamps, curtains, chairs and a lot more ! 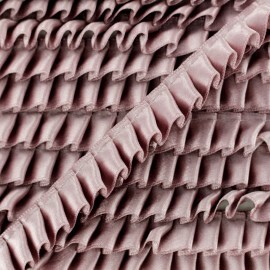 15 mm pleated ribbon in ancient pink satin. The pleated satin braid is a basic of sewing, choose the color that suits you and finish nicely your clothes (sleeves, neck, etc.) or add some frilly satin ribbon to your interior: on your lamps, curtains, chairs and a lot more ! 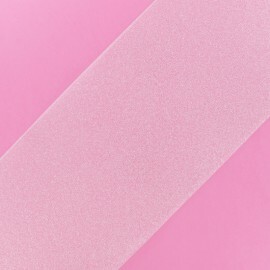 15 mm pleated ribbon in candy pink satin. The pleated satin braid is a basic of sewing, choose the color that suits you and finish nicely your clothes (sleeves, neck, etc.) or add some frilly satin ribbon to your interior: on your lamps, curtains, chairs and a lot more ! 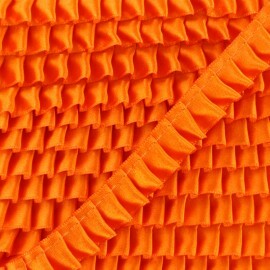 15 mm pleated ribbon in orange satin. The pleated satin braid is a basic of sewing, choose the color that suits you and finish nicely your clothes (sleeves, neck, etc.) or add some frilly satin ribbon to your interior: on your lamps, curtains, chairs and a lot more ! 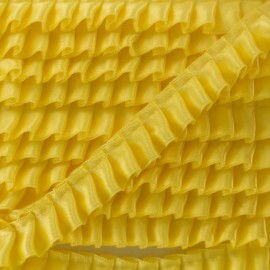 15 mm pleated ribbon in yellow satin. The pleated satin braid is a basic of sewing, choose the color that suits you and finish nicely your clothes (sleeves, neck, etc.) or add some frilly satin ribbon to your interior: on your lamps, curtains, chairs and a lot more ! 15 mm pleated ribbon in anise green satin. The pleated satin braid is a basic of sewing, choose the color that suits you and finish nicely your clothes (sleeves, neck, etc.) or add some frilly satin ribbon to your interior: on your lamps, curtains, chairs and a lot more ! 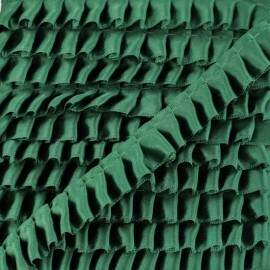 15 mm pleated ribbon in imperial green satin. The pleated satin braid is a basic of sewing, choose the color that suits you and finish nicely your clothes (sleeves, neck, etc.) or add some frilly satin ribbon to your interior: on your lamps, curtains, chairs and a lot more ! 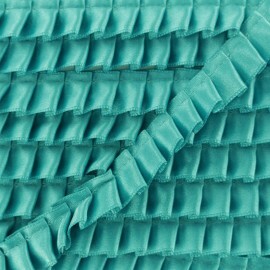 15 mm pleated ribbon in turquoise satin. The pleated satin braid is a basic of sewing, choose the color that suits you and finish nicely your clothes (sleeves, neck, etc.) or add some frilly satin ribbon to your interior: on your lamps, curtains, chairs and a lot more ! 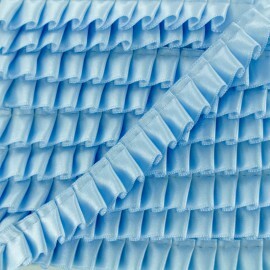 15 mm pleated ribbon in sky blue satin. The pleated satin braid is a basic of sewing, choose the color that suits you and finish nicely your clothes (sleeves, neck, etc.) or add some frilly satin ribbon to your interior: on your lamps, curtains, chairs and a lot more ! 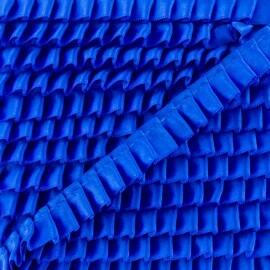 15 mm pleated ribbon in royal blue satin. The pleated satin braid is a basic of sewing, choose the color that suits you and finish nicely your clothes (sleeves, neck, etc.) or add some frilly satin ribbon to your interior: on your lamps, curtains, chairs and a lot more ! 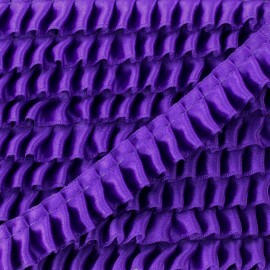 15 mm pleated ribbon in purple satin. The pleated satin braid is a basic of sewing, choose the color that suits you and finish nicely your clothes (sleeves, neck, etc.) or add some frilly satin ribbon to your interior: on your lamps, curtains, chairs and a lot more ! 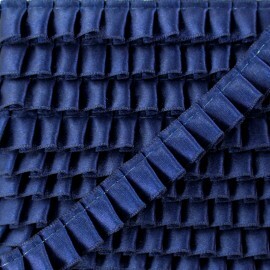 15 mm pleated ribbon in navy blue satin. The pleated satin braid is a basic of sewing, choose the color that suits you and finish nicely your clothes (sleeves, neck, etc.) or add some frilly satin ribbon to your interior: on your lamps, curtains, chairs and a lot more !